I’ve interacted with many of you who have declared that this year will be the “Year of Evangelism” within your church. One aspect of developing that vision is giving sermons on Evangelism, or developing a sermon series. In your preaching on evangelism — call people to do great things. Why Bother? More than obedience, but out of the overflow of our relationship with Jesus. What Motivates God to reach bring people into his Kingdom? What’s God’s plan? The pre-work of the Holy Spirit in Evangelism — How the Father draws us to the Son. Basic Evangelism skills: questions, testimony, how God works in your life. If you were to touch on each of these themes just briefly, all of them would take at least 2 months of Sundays, and likewise, there are plenty more. Each one could be a 3-4 part sermon series on evangelism. One suggestion is to print out this list and use it to brainstorm your own sermon series on evangelism. I once did a mind map of evangelism and discovered that I could do evangelism sermon series for more than one year of Sundays. What is in your sermon series on evangelism? Feel free to share in the comments below. One of the goals on preaching a sermon series on evangelism is to raise the temperature or passion for evangelism in the local church. In preaching your series on evangelism, or studying evangelism, the goal shouldn’t be just increasing a skill set, but also increasing passion within a congregation. How do you coach passion? About 2 years ago, a church planting coach asked me this question. Passion is like fuel — it burns and needs to be replaced. When we attend a conference, we are inspired with new ideas, we feel a fresh wave of passion, but then life gets in the way and the fire fades. Reality blocks the dreams we had and we settle back into what was comfortable. Passion is the fuel that helps you persevere through the blockages and inertia that stands in your way. 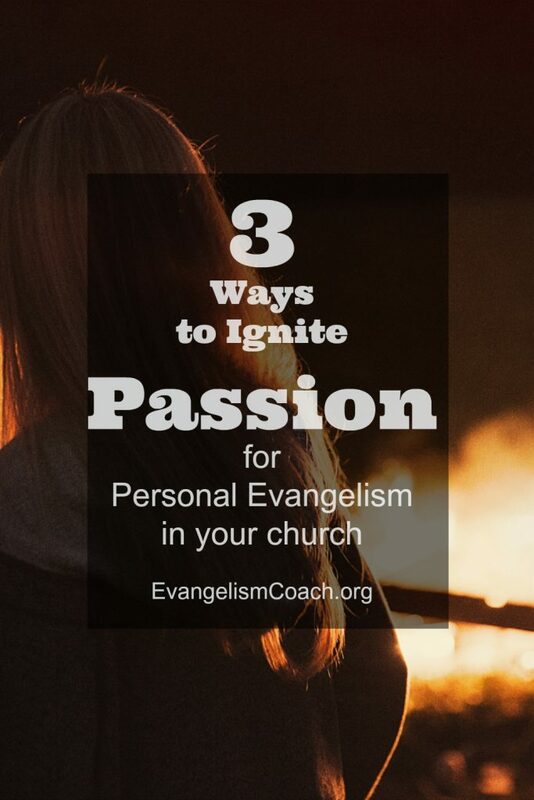 How did I coach passion for Evangelism? In my church, I would occasionally preach on Sunday morning, and then nearly every Sunday night for our 2nd service. 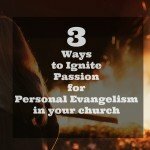 Here is how I coached a passion for personal evangelism when I was the regular preacher. This was somewhat unintentional, but happened in my sermons. At least 2-3 times a month I’d share a conversation I had had with someone. Personal evangelism is something I do, it happens in my life, and some of those conversational encounters would be connected to the sermon theme. These conversations were often part of the overflow of my study of Scripture and sermon preparation. They were part of the overflow from my networking and reading books out in public spaces like Starbucks. I’d often connect the conversational encounter to the text, and then share my thinking process as I debriefed the conversation with the congregation. What was that person’s spiritual thirst? 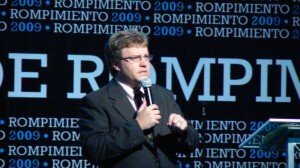 What was the Holy Spirit sharing with me? 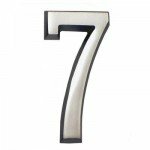 What is the connection to Jesus and to the text? Conversations that were failures and laugh at myself. Conversations that were adventures in missing the point. Conversations that I wish I had, if I could do it over again. All illustrations were to highlight the text I was preaching, not a “look at what I did this week” type. In other words, I wasn’t bragging about what I was doing, but connecting my stories to the text from which I was preaching. I found that most of the heart issues that the Bible texts raised could be illustrated by a conversation I had had with someone. Instead of asking the congregation “who did you talk to this week,” I simply shared the conversations I was having. It modeled personal evangelism instead of telling them they needed to do it. These types of illustrations would creep into sermons 2-3 times a month. By regular modeling of personal evangelism in my sermons, a funny thing happened. People in the congregation eventually started telling me of their evangelism conversations with people. The debriefing questions that I used in my sermon would start being reflected back to me, as the people were thinking themselves about these themes. I’d ask follow up coaching questions to help my people grow in their processing skills. My congregation began to reflect the modeling I did in my sermons and small group leadership. 3. Connecting the text to my prayers for people who don’t know Christ. Nearly every theme for biblical preaching can be connected in a sentence or two to an evangelistic prayer. For example, perhaps you are preaching on forgiveness. You’ve shared how you found forgiveness, you’ve shared how Christ forgives our sin. What I found is that with this kind of thematic connection, people in the congregation would begin to think of their neighbors and non-Christian relationships more often. They would begin to share with me how they were praying of their neighbors, and often their conversations with people. 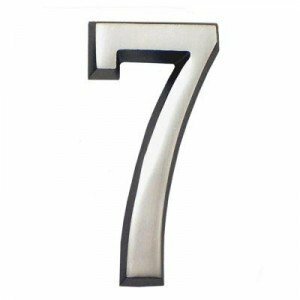 During your sermon preparation time, ask yourself, how does this principle point fuel my prayers for my unsaved neighbors and relatives? Simply make that a passing sentence on a regular basis and if your congregation was like mine, you’ll find that the congregation will begin to think the same way. I was searching through my files the other day and found this handout. I quote it as is with attribution. 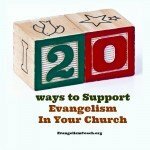 Launching evangelism in your congregation is not about techniques or right practices. Evangelism is about God working through you and your congregation to become vibrant witnesses to the Good News of Jesus Christ. Ask for guidance and courage to go where God is leading you. Gather together for Bible study. Observe in the Scriptures how the Holy Spirit fills people with courage to bear witness to the Good News of Jesus Christ. What story about Jesus brings you joy? Who might you tell about Jesus? The promises of the Good News of Jesus are meant to be shared with others. We are not to be complacent, apathetic or bored. The Good News of Jesus changes lives – yours and mine. How have you experienced the Good News of Jesus in your life? Celebrate with those who might be interested in evangelism. 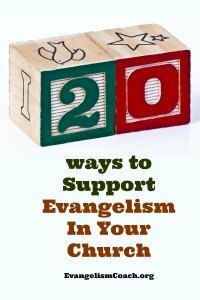 Seek ways to extend your evangelism team to embrace your whole congregation. Don’t let a committee be the only one to experience the joy of sharing the good news of Jesus. Live the joy found in Christ Jesus. Equip people to become more comfortable about sharing their faith in Christ Jesus. Provide training and opportunities to practice faith-sharing. Take time to identify witnessing opportunities. What training might be helpful? Don’t make it too easy. Go out on a limb. Plan an event no one will want to miss. Have a Fall Fiesta for the neighbors. Offer a jazz worship on Saturday night. If nothing else, add something extra to your Christmas Eve or Easter worship. Invite people to come! Spend some money on publicity. What event(s) might you host for the neighbors or community? Remember your mission: Bear witness to the love of God in Christ Jesus. Copyright © 2004 Evangelical Lutheran Church in America. May be reproduced for local, non-sale use provided the above copyright notice is included. If this is your year of evangelism, what might you plan on doing this year to grow your congregation’s evangelism? Are there some outreaches to plan? 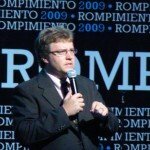 Seminars to attend or organize? Cleaning out file cabinets at the beginning of the year, I find all sorts of great stuff. 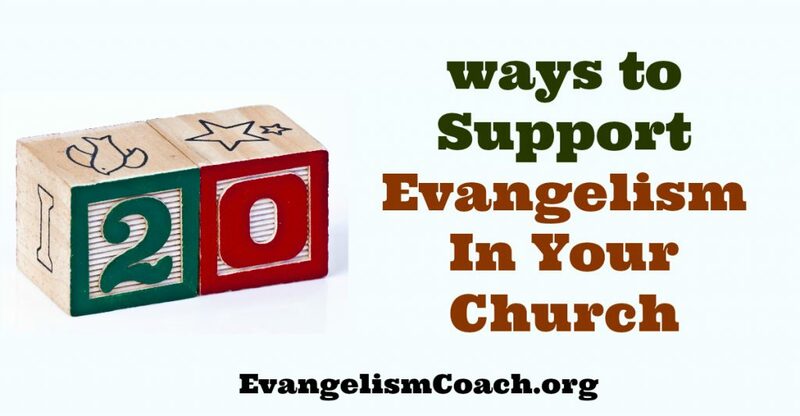 Let session members (or Your leadership Team) know of your interest in evangelism. Volunteer to serve on the Evangelism Committee. (If the church doesn’t have one, volunteer to start one). Ask for (and support with your own attendance) training in faith sharing (invite and encourage others to attend, also). Speak to visitors and new members EVERY Sunday!!! Intentionally make a place for and welcome new people and visitors (at Sunday school, after church coffee hour, men / women’s meetings, covered dish dinners, worship, etc.). Actually share with another person how God has acted in your life. From a handout I got somewhere. No longer remember where from.